About 100 captive elephants were paraded on Wednesday during Thrissur Pooram, the largest annual temple festival in Kerala, without the requisite approval from the Animal Welfare Board of India. The 36-hour-long festival was marked colourful fireworks, percussion and parading of caparisoned elephants in Thrissur town. The Thrissur Pooram is being held since 1798 at Thekkinkkadu ground in front of the famous Vadakkunnathan Siva temple. Two groups, consisting of five temples each, take part in the Pooram in a competitive mode. One group is led by Thriuvambadi Srikrishna Temple and the second one is led by Paramekkavu Bhagavati Temple. 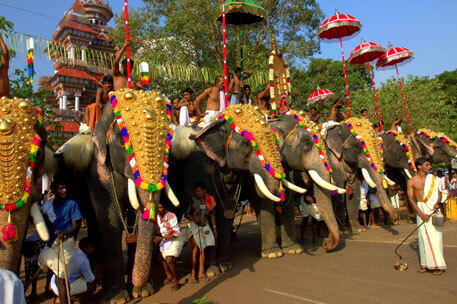 The 10 temples send their pooram (complete procession) accompanied by elephants carrying deities. Exchange of ornamental umbrellas atop the elephants standing face to face is one of the spectacular events of the festival. The temples parade about 100 captive elephants owned by individuals and religious institutions. According to V K Venkitachalam of Heritage Animal Task Force, an animal rights group, which has been campaigning against keeping elephants in captivity and parading them, 30 caparisoned elephants belonging to the two leading temples would stand continuously from 11 am till 9 pm with at least four persons atop. Seventy other elephants from the smaller temples would be made to stand from 11 am to 2 pm. Again, a batch of elephants would be paraded from night to early morning. "The jumbos are subjected to severe torture and cruelties during these festivities. They have to stand hours in chains under the hot sun and are exposed to fireworks, noise of the crowd and percussion," says he. Incidents of elephants becoming violent, killing mahouts and onlookers and jumbos falling unconscious are common during the festivities. "This year, so far, eight persons have been killed by the jumbos during the festivities in different temples," says he. According to him, at least half of the captive elephants in Kerala are partially or fully blind and a few have paralysed trunks and wounded and infected legs. Animal rights activists point out that the practice violates laws such as the Wildlife Protection Act, the Performing Animals (Registration) Rules, 2001 and the Kerala Captive Elephants (Management and Maintenance) Rules, 2003 and Prevention of Cruelty to Animals Act 1960. Activists point out that section 23 of the Kerala Captive Elephants Rules, 2003, makes it mandatory that elephants be exhibited or used for performance only if their owners are registered with the Animal Welfare Board and permission is obtained from the board. After getting a lot of complaints on torture of captive elephants while parading them, on April 20, the Animal Welfare Board of India had sent a letter to the chief minister of Kerala, chief secretary, secretaries of forest and devaswom ( temple administration) departments, and Thrissur district collector and the city police commissioner, pointing out that the state was yet to obtain permission for parading elephants during the festival. According to the Board, none of the elephants in the state has been registered with the Board. It would be illegal to parade the elephants without the required permission, said the Board in the letter. However, the state government made it clear that it would not intervene with the age-old practice of parading elephants during Pooram. "If anyone has any complaints with regard to the upkeep of the animals during the festivities, they can bring it to the notice of the government and the government will look into it. But there is no question of any interference with the traditional practices and rituals of the pooram," said state forest minister Thiruvanchoor Radhakrishnan. He also said the government has already issued various guidelines on maintenance of captive elephants in the state. Soon after the Board's letter to the state, PETA India (People for the Ethical Treatment of Animals), New Delhi, a non-profit working on animal rights, filed a public interest petition in Kerala High Court, seeking an urgent interim order to the Centre and the state government to ensure that no elephant is paraded or exhibited at the Pooram without permission from the Animal Welfare Board of India. However, the vacation bench of the court said detailed hearing was needed in this case and postponed the hearing for after May 20, when the court reopens after the vacation. Activists like Venkitachalam point out that a majority of the captive elephants in Kerala are either owned by politicians or close relatives and associates of politicians. "That is why political leadership, whether it's Left or Right, is reluctant to address the issues of the captive jumbos," says he.